From new construction to restoration, from chimney repair to tuck pointing, we offer quality work at competitive prices. Spitson Masonry, Inc. specializes in brick, block and stone masonry applications on residential, commercial and industrial projects. 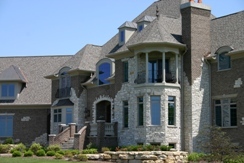 Our services also include tuckpointing, chimney repair and masonry restoration. Spitson Masonry, Inc. is a non-union masonry company employing an average of 15 – 20 employees, and we are able to bid competitively on prevailing wage jobs and government projects. Spitson not only serves the McHenry and Lake County Areas, but also Chicago and Southern Wisconsin. At Spitson Masonry, Inc. we understand that education and training are vital to the success of our business. Our employees’ achievements include scaffolding certifications, machine operator training, and OSHA compliance training. We are members of the Better Business Bureau, Woodstock Chamber of Commerce, and NFIB.